Be the first to share your favorite memory, photo or story of Shirley . This memorial page is dedicated for family, friends and future generations to celebrate the life of their loved one. 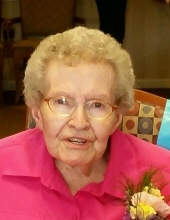 Shirley D. Nolan, 91, of Pontiac, IL passed away at 8:20 am on Friday, January 18, 2019 at OSF St. Joseph Medical Center in Bloomington. Her funeral mass will be held at 11:00 am on Saturday, January 26, 2019 at St. Mary’s Catholic Church in Pontiac with Father David Sabel officiating. Visitation will be held from 9:30-10:45 am at church on Saturday, prior to mass. According to her wishes, cremation rites will be accorded following services. Inurnment will be at a later date at St. Mary’s Cemetery in Pontiac. Calvert & Martin Funeral Home is handling arrangements for the family. Memorial contributions may be made to the St. Mary’s Catholic Church in Pontiac, Multiple Sclerosis Foundation, or the Livingston County Cancer Fund. Shirley was born July 20, 1927 in Evanston, IL a daughter of Harold W. and Hilda G. (Lee) Orr. She married John “Jack” Nolan on September 25, 1947 in Pontiac, IL. He passed away on January 8, 1994. She is survived by three daughters: Carol Alford of Pontiac, IL, Marcia (Jim) Meints of Lexington, IL, and Sandra (Paul) Vogt of Plainfield, IL; nine grandchildren; eighteen great grandchildren; one great-great granddaughter; and one daughter-in-law: Brenda Nolan of Towanda, IL. She was preceded in death by her parents; two brothers; one sister; one son: Dennis Nolan; and one son-in-law: Wayne Alford. Shirley graduated from the Saunemin High School. She worked at the Nationwide Glove Factory for over fifty years. She was a member of the St. Mary’s Catholic Church. Shirley also played cards in the neighborhood card club. She enjoyed sewing, vacationing in Wisconsin with Jack, and baking. Her chocolate chip cookies and banana bread were legendary, and unable to be duplicated. Most of all, Shirley will be remembered for her love of her family, they meant everything to her. Shirley’s sense of humor and wit will be missed. "Email Address" would like to share the life celebration of Shirley D. Nolan. Click on the "link" to go to share a favorite memory or leave a condolence message for the family.